In 1974 Tower Bridge was modernised. One of the three steam engines which worked the bridge had to be moved to make way for the new electric machinery. We were fortunate to acquire this historically important engine. Tower Bridge was one of the finest examples of the practical application of steam generated hydraulic power. The roadway sections of the bridge that open weigh over 1,000 tons. To open the bridge in a smooth, controlled manner took a considerable amount of power. The engines were located in the engine house on the south side of the River Thames. Each engine drove two sets of hydraulic ram pumps which forced water into hydraulic accumulators. The water was stored at a pressure of 750 lbs per sq. inch, ready to be delivered through a system of pipes to the eight hydraulic engines. There were four on each side and they were located in the bases of the two main towers of the bridge. As with most Victorian plant, there was plenty of spare capacity. The bridge could be opened using only one of the steam engines and two hydraulic engines. A cog wheel on the main shaft of the hydraulic engine engaged in a quadrant attached to the bascules, so effecting the lift. For one descent of the plunger in the accumulator, the bridge could be opened and closed twice. When the bridge was opened infrequently, the engine only needed to work intermittently. 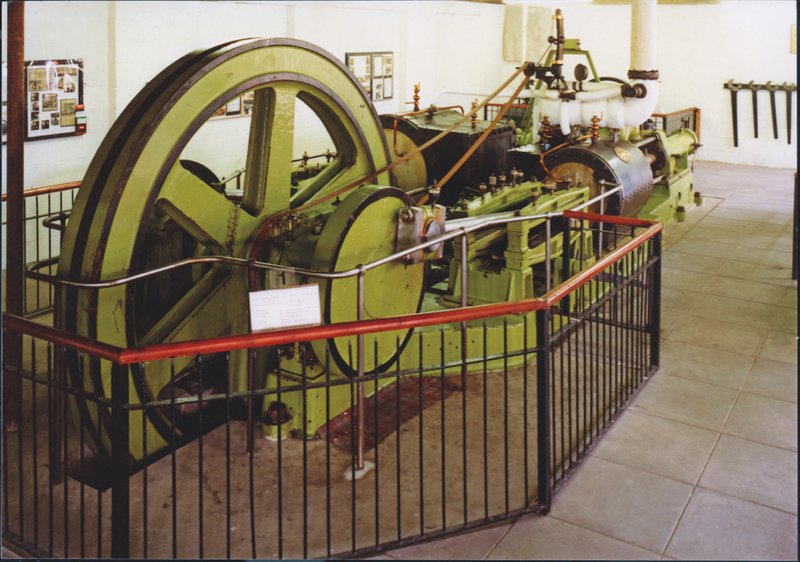 On busy days, one steam engine would be kept running continuously at 10–15 rpm, keeping the accumulator topped up at all times. Tower Bridge was opened in 1898 with two steam engines. The engine on display at Forncett was added to the original two engines in 1941. We completed the reassembly and construction of a new engine house in September 1976. DONATED BY The Corporation of the City of London. TYPE Horizontal Cross Compound Hydraulic Pumping Engine. 150 HP. BUILDER Vickers Armstrong Ltd., Elswick Works, Newcastle-upon-Tyne. 1941. Engine No. 1190SE. CYLINDERS HP. 23 inch. LP 38 inch X 30 inch Stroke. VALVES HP. Meyer expansion valve. LP. Simple slide valve. FLYWHEEL 9 foot diameter. Single casting. Weight 9 tons with crank discs. HYDRAULIC PUMP Two driven off tail rods. Pistons 6.5/8inch generating 700 lbs per sq. in water pressure at a volume of 430galls per min.